Harry Reid's seat not such an easy grab? Thread: Harry Reid's seat not such an easy grab? Re: Harry Reid's seat not such an easy grab? Keep in mind of course that it's from the Huffington Post and will have a definite viewpoint, but the analysis is sound. DeNile. It's where you live Deuce. H. Reid, will be unemployed come Nov. It may not be as high as he would like but it hasn't dropped hugely lately. 2. Obama's numbers are about at the same place Reagan was at this point in his term. It's still early yet. Last edited by Groucho; 08-06-10 at 09:54 AM. The Rasmussen Reports daily Presidential Tracking Poll for Friday shows that 30% of the nation's voters Strongly Approve of the way that Barack Obama is performing his role as president. 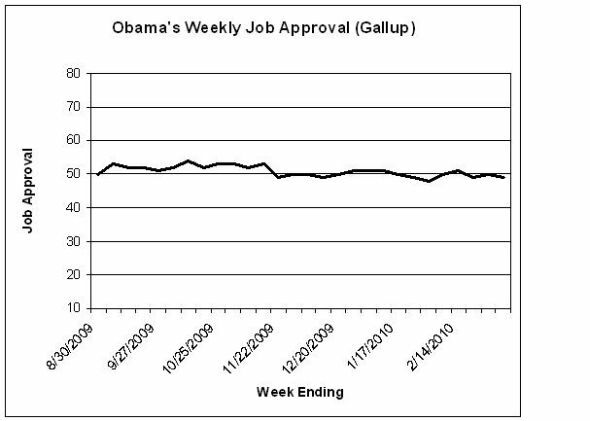 Forty-two percent (42%) Strongly Disapprove, giving Obama a Presidential Approval Index rating of -12 (see trends). That’s the highest level of Strong Approval for the president since mid-May. But how long before your side declares martial law?? I don't see "my side" ever declaring martial law. It will not happen. Which is exactly what each and every Democrat espouses!!! No it isn't. We don't espouse it all. I know I certainly don't espouse it, for instance. The Makeout Hobo is real, and does indeed travel around the country in his van and make out with ladies... If you meet the Makeout Hobo, it is customary to greet him with a shot of whiskey and a high five (if you are a dude) or passionate makeouts (if you are a lady).